INDIVIDUALITY - ONE OF OUR STRENGTHS. For many decades we have also been building special machinery for all different areas of operation. We deliver tailor-made solutions exactly according to our clients' needs. Yes, I have read the Privacy Notice and agree to allow MASCHINENFABRIK RUDOLF SCHÖBERL Gesellschaft m.b.H. & Co. KG. to store and process my data. 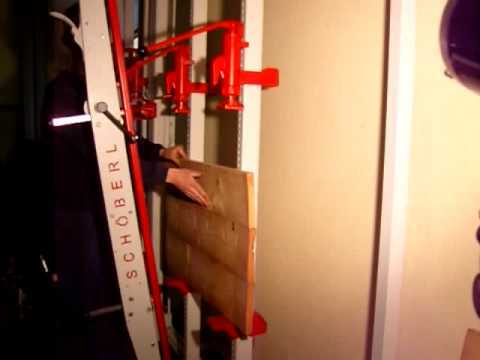 The Schöberl Gluing Stand can be used for all purposes and plays therefore an integral part in wood processing. For decades it has been our top-selling product world wide and has proven itself through simple mounting, a rapid adjustment of the size through the Schöberl quick lock and our solid construction. All our gluing stands are equipped with our robust and reliable Schöberl Hydraulic Chucks, which have a finely adjustable 3.000 daN(kp) press capacity. The adjustable cross members, which can be easily shifted, are made from high-class steel square pipes and have a 24 mm hole matrix. Our gluing stand is available for wall-mounting, as a mobile version which can be loaded one- or two-sided, or as stand-alone. We offer different kinds of pressure bars with quick locks or pneumatic zylinders for all models. Additionally, it can be equipped with a frame press, a heating ruler made of stainless steel, or with our newly developed holding down devices. Our standard model - approved thousandfold. Very little space is needed through the wall-mounting. Picture with our heating ruler from stainless steel. A real alternative to big frame presses. Absolute precission through face milled, adjustable stop brackets. Picture with our newly developed holding down device with quick lock. The mobile frame is built for one- and two-sided loading by default, so if needed additional cross members can easily be mounted. The slidable holding down devices with quick lock enable an easy and exact positioning of the pressing rail on the work piece. The picture shows a model, where the slidable holding down devices are equipped with two pneumatic cylinders each. Perfect for efficient gluing of a high number of work pieces. The original Schöberl Hydraulic Chuck, built of hiqh quality spheroidal graphite iron, is able to reach a press capacity of up to 3.000 daN, which can be finely adjusted by hand. Our unique quick lock enables a rapid setting of measurements. Our brackets are as simple as convenient and enable a quick vertical adjustment. The newly developed holding down device is the best solution currently available on the market. Through a special system a uniform distribution of pressure over the entire clamping is reached with a single movement of the handle. For easy accessibility the device can be released on top and swung to the front. Together with bar clamps this support can be used to precisely glue hollow work pieces.